University of New Brunswick Varsity Reds hockey player Philippe Maillet has been named winner of one of two 2017 BLG Awards, recognizing the top male and female university athletes in Canada. Mr. Maillet is the second Varsity Red to win a BLG Award, joining current UNB Hockey associate coach Rob Hennigar, who won in 2008. Arielle Roy-Petitclerc, of Laval University’s Rouge et Or women’s soccer team, was also named a BLG Award winner. Mr. Maillet was recognized following an impressive season that saw him score 23 goals and 32 assists in 30 regular season games, capturing the Atlantic University Sport and U Sports scoring titles. The fourth-year forward was awarded the Senator Joseph A. Sullivan Trophy as the U Sports Player of the Year, named a U Sports and Atlantic University Sport First Team All-Star, and was the University Cup most valuable player as the Varsity Reds captured the team’s second consecutive national championship. 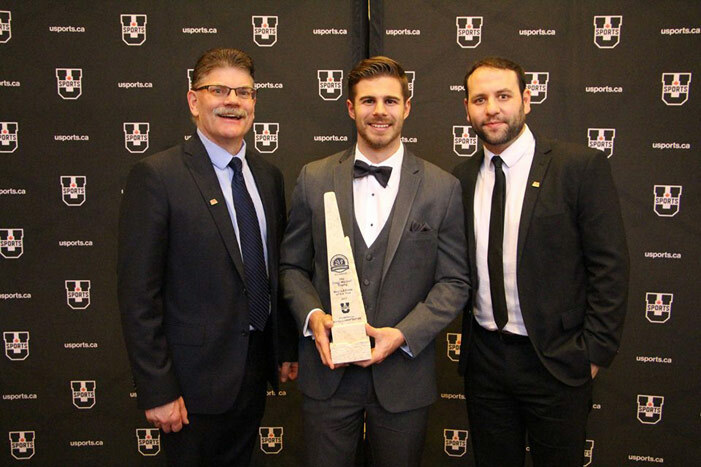 Mr. Maillet, from Terrebonne, Que., is a two-time Atlantic University Sport most valuable player, a three-time Atlantic University Sport First Team All-Star and a two-time U Sports/Canadian Interuniversity Sport First Team All-Star. He’s twice been named the University of New Brunswick’s top male athlete, in 2014-15 and 2016-17. He is the oldest of two children born to Mario Maillet, a recently retired Montreal firefighter, and Line Richard, a home-based consultant. Upon completion of the Varsity Reds season, Mr. Maillet signed a contract with the Ontario Reign, of the American Hockey League, the top farm team of the NHL’s Los Angeles Kings. The Reign are currently involved in the AHL’s Calder Cup playoffs. The BLG Awards were established in 1993 to recognize the top female and male athletes from universities affiliated with U Sports. The awards are based on athletic accomplishments, outstanding sportsmanship and leadership. Each of the 56 U Sports schools nominates one female and one male athlete of the year. From these nominees, one female and one male athlete are chosen within each of the four conferences: Atlantic University Sport (AUS), Réseau du sport étudiant du Québec (RSEQ), Ontario University Athletics (OUA) and Canada West Universities Athletic Association (CWUAA). To be eligible, a student athlete must have competed in a U Sports-sanctioned sport for a minimum of two years and cannot be a previous recipient of a BLG Award. All nominees receive a commemorative gold ring and winners are presented with a trophy and a $10,000 scholarship to attend a Canadian university graduate school. Winners are selected by the Canadian Athletic Foundation (CAF), a not-for-profit board established for the purpose of administering the BLG Awards and protecting the integrity of the selection process. The CAF Board of Trustees consists of 19 members from five Canadian cities representing major corporations from across the country who are committed to ensuring that Canadian university athletes receive the recognition they deserve.